In the last few days there have been news that die-hard iPhone fans are picking up iPhone 5S for as high as 1 Lakh rupee from the grey market. If you visit ebay, the general pricing ranges around 70,000 for a iPhone 5S. The 64GB version is priced insanely at 1.32 Lakh. Now, these phones are making appearance at such high price point is because there is a demand in the market for the same. Additionally, these prices are going to come down very soon, as and when iPhone 5S starts becoming more available in India. However, there are Indian vendors that are offering iPhone 5S at a pricing that is closer to its actual price. 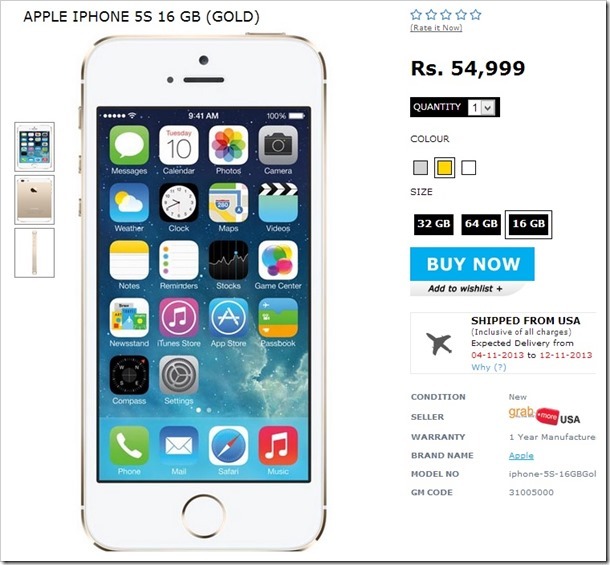 Grabmore.in, an ecommerce portal which operates in India as well as in the US, is offering iPhone 5S 16GB version for Rs. 54,999/-, a price which is quite close to what iPhone 5S should actually retail at. The iPhone 5S is available in all 3 colors gray, white and gold! While iPhone 5S launch received mixed response worldwide, the benchmark tests have proven that it is the fastest smartphone on earth today, that too by a fair margin. Grabmore is not only offering 5S at a competitive rate, they are also offering shipping which is quite fast. According to them, the iPhone will be imported from USA, and will ships within 2-3 business days from their warehouse in USA. It will reach to all Indian destination in 7-15 Business Days. The price of iphone will not increase for the end user because the price mentioned above includes all customs duties and shipping charges! So, if you want to be one of those who wants to flaunt an iPhone 5S, head over to grabmore iPhone page and hit the buy button! Even Apple iPhone 5c 16GB is available for Rs.51,999 and 32 GB version for Rs.61999 . This time apple should launch both phones in India for cheaper prices . Atleast iPhone 5c to 30-35 k .